Peer Fischer, a Research Group Leader at the Max Planck Institute for Intelligent Systems and Professor at the University of Stuttgart, normally works on micro- and nanorobots. His lab also develops the nanofabrication methods that are needed to develop such tiny swimmers. Holography was not one of his core interests. “However, we were looking for a way to move large numbers of microparticles simultaneously so that we could assemble them into larger more complex structures,” explains Fischer. His research team has now found such a method with acoustic holography, and it reports the first acoustic hologram in this week’s issue of Nature. The method promises a number of applications in addition to particle manipulation. Manipulating the three-dimensional structure of acoustic waves was previously only possible with what physicists call a phased array transducer. This is an ensemble of many acoustic sources positioned side by side that can individually emit sound with varying phase delays. The necessary driving electronics, however, is bulky and expensive. “We can now generate sound in a 3D without this complex technology,” says Kai Melde, who conducted the experiments at the Max Planck Institute for Intelligent Systems as part of his Ph.D. research. The researchers first demonstrated a hologram that generates sound pressure in the shape of Pablo Picasso’s dove of peace. Microparticles suspended in a liquid follow the pattern and form the image. To achieve this, the team first computed where and how strongly the acoustic waves, or more specifically their phases, needed to shift to translate the lines of the dove into an area of increased sound pressure. In this way, they attained a map of the phase shifts. Based on this map, they then fabricated the acoustic hologram: using a 3D printer they created a relief from a plastic that transmits sound faster than the surrounding liquid. The printer applied different thicknesses of material depending on the required phase delay. Ultrasound waves transmitted through the hologram interfered behind the relief plate in such a way that the sound pressure reproduced Picasso’s dove of peace. 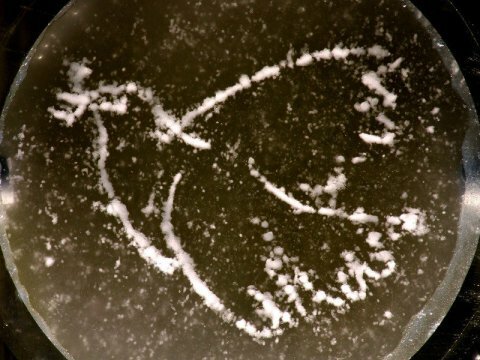 And as soon as they positioned a container filled with water and microparticles in the focal region, the particles were quickly pushed into the shape of the dove. The researchers showed that the technology can also work in 3D by forming a holographic stack with the images ‘1’, ‘2’ and ‘3’. Even if the Stuttgart-based researchers cannot change the acoustic sculptures on the fly, they are able to move particles on defined trajectories. They demonstrated this with a polymeric particle on water: using the sound pressure hologram, they generated a ring-shaped crest on the water’s surface which looked as if they had frozen the ripple caused by a stone that was thrown into the water. A particle floating on the water and influenced by the sound pressure quickly swung to the crest of the wave and surfed along the circle until the sound was switched off. “Such contact-free methods to move particles using sound could be interesting as a material transporter for process engineering,” says Kai Melde.